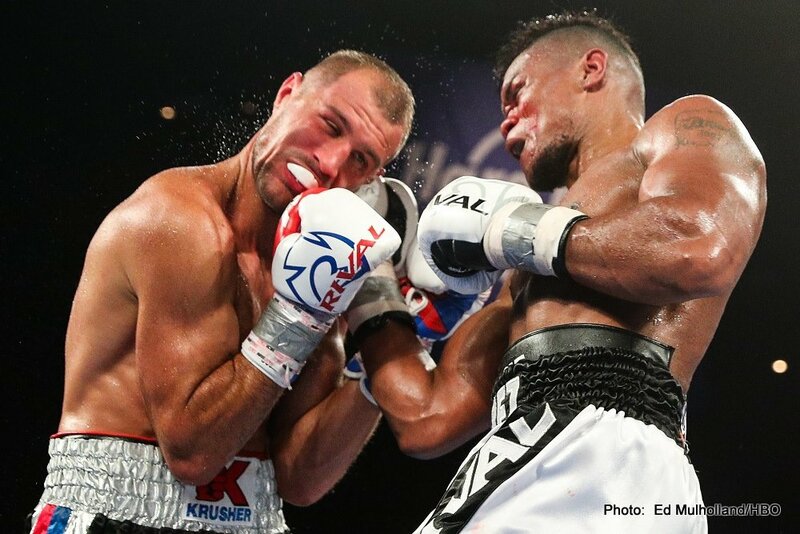 As fans know, unbeaten Colombian talent Eleider Alvarez shook up the light-heavyweight division in a big way earlier this month, stopping as he did defending WBO champ and pound-for-pound entrant Sergey Kovalev in seven exciting and very interesting rounds. There was, however, a rematch clause in the contract, and Dan Rafael of ESPN.com has reported how Kovalev will exercise it. The rematch is on, and as per the contract it must take place before the end of February. So who wins? Can 35 year old Kovalev avenge his third pro loss, or will “Storm” Alvarez, a year older but seemingly a whole lot fresher, repeat his big win? The crushing stoppage Kovalev suffered was indeed a bad one; one that at the time looked as though it may well have signalled the end of his career. Certainly nobody will be too shocked if Alvarez beats Kovalev again. The Russian star has enjoyed a fine and long career, first winning a world title half a decade ago, and he may well be past his best, his punch resistance sorely compromised. But maybe we should not be so fast in writing off Kovalev. The rematch will be interesting, and just maybe things will turn out vastly different in the sequel. Alvarez was faster, cleverer, more accurate with his shots and he showed he has a reliable chin. What can Kovalev do better in a return (he was of course ahead on all three cards before getting tagged)? Kovalev, an excellent fighter in his day, may have seen his day go by. Never has Sergey been able to avenge a pro loss (he has of course only been beaten by Alvarez and by the sublime skills belonging to the now retired Andre Ward) and when he does enter into a rematch with his latest conqueror, chances are big Kovalev will enter the ring as a significant underdog. With the sheer power his carries, Kovalev will always have the proverbial puncher’s chance, in any fight, and this rematch fight will be no different, but it really would be some inspired turnaround from the Russian is he did manage to get his revenge. Alvarez currently carries the hunger and desire Kovalev used to carry (and may still carry), and as such he will take some beating – either by Kovalev or by any of the other reigning champions at 175. Then again, they say the great fighters always have one last great fight left inside them. Is Kovalev a great fighter?